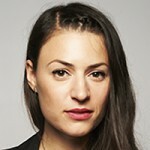 Milène Larsson is Senior Producer and Reporter for VICE News, VICE.com and Broadly. Multi award-winning journalist and documentary filmmaker Milène Larsson has made more than 30 films covering civil rights and social uprisings - such as Young and Gay in Putin’s Russia, Israel’s Radical Left and Istanbul Rising - and migration, which she has reported on extensively in the British Media Awards winning documentary series Europe or Die, born out of an on-going commitment to document the efforts of those risking their lives to reach Europe and the forces tasked to keep them out. She also investigates gender norms and women’s social status around the world for VICE’s women’s interest channel Broadly, like the documentaries China’s Last Matriarchs and From Iron Girls to Left Over Women about the state of feminism in China. She has appeared on HBO, CNN, BBC, Al Jazeera, MSNBC and Sky News, helped produce ‘VICE’ on HBO, an Emmy nominated news-magazine show, and given a TEDx talk about what borders are doing to our common humanity. Milène Larsson was born in 1983 in Stockholm, Sweden. She studied English at Stockholm University and after a short stint at the nightlife magazine Nöjesguiden, and playing in bands, joined the small team that launched VICE in Scandinavia in 2004. She was the Scandinavian editor and later on the European Managing Editor of VICE Magazine in London, until she switched over to filmmaking full time. In 2014, she was part of the core team behind VICE News - VICE's award-winning news vertical catering to a global youth audience with immersive reports from around the world. She is currently based in London and is fluent in English, Swedish and French.